Sintra is in Portugal’s Estoril region, some 28 kilometres from Lisbon. The town sits in a spectacular setting amid the pine clad slopes of the Serra de Sintra. Since 1995 the area, including the Northern slope of the Sierra de Sintra have been designated a UNESCO World Heritage Site. The best places to stay in Sintra are centrally located for enjoying this romantic and historic town. During the fifteenth century the town became a destination for Portugal’s elite who made homes here. Sintra has been described as ‘Disneyland for grown ups’ due to its extraordinary mix of flamboyant architectural styles. The town is a monument to centuries of history. In the ninth century the moors built a fortress on top of the Sintra mountain, its crenellated ramparts remain. Later nobles and rich businessmen founded palaces and estates. In the eighteenth and nineteenth centuries the town became a centre for the ‘Romantic’ movement in art and thought. This is symbolised in many of the buildings - the Palacio da Pena being a particularly striking example. This is also simply a great place to hang out - enjoy the town and surrounding countryside, the beautiful beaches, sample the wines and delicious seafood! The unique Palacio da Pena was built in 1854 by Fernando II as a romantic hideaway. It is the town's greatest example of the flamboyant and decorative building style. Castelo dos Mouros is the ruined hilltop Moorish castle which dates back to the 8th century. The views from the castle are stunning! 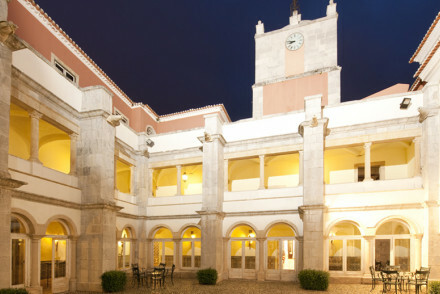 Palacio nacional is located in Sintra's historic centre, and its history dates back one thousand years. Come here for the history, architecture and artworks. The Monserrate Palace is just out of town, but well worth the short trip. It's a beautiful building where Eastern and Moorish architecture have combined to great effect. Quinta da Regaleira is a grand 20th century house with a gothic facade and even better gardens to the rear, full of hidden tunnels and symbolism of ancient orders! 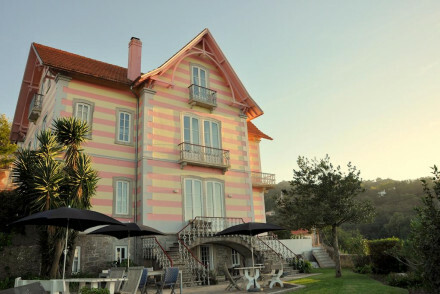 Don't forget that the best places to stay in Sintra are busy year round. This is a popular town, so do your planning and book well ahead. 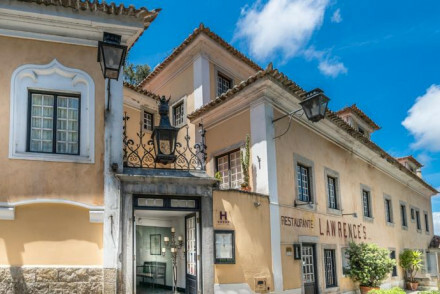 Lawrence’s Hotel is a stunning period property right in the centre of town. Rooms and suites are elegant and sophisticated and there’s a fine dining restaurant. 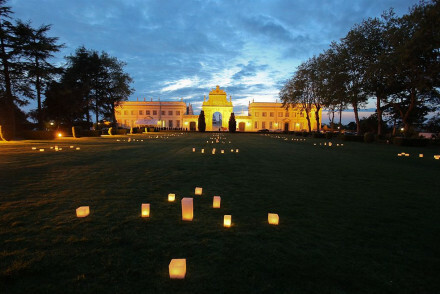 Sintra Marmoris Palace is located on the edge of both the city and National Park. It's an elegant 19th century manor house with spacious rooms, lush gardens and stunning views. Tivoli Palacio de Seteas is a beautiful five mansion just outside Sintra. There are thirty traditionally styled rooms and suites which ooze opulence, plus two pools, excellent restaurant and tennis court. Penha Longa is slightly further away, but worth it! Here you'll find championship golf courses, state of the art spa, contemporary accommodation and world class dining. If you think that a self catering property would be better suited to your needs, we recommend our online partner, booking.com. Sintra is 25 minutes by car from Lisbon airport and 45 minutes on the train. There is no best time to visit - Sintra is a popular city year round. However for the best weather you should aim for spring and early autumn - the days are long and bright and you'll avoid the intense heat of the summer months. If you plan to hire a car to explore the surrounding area, we recommend our online partner Rentalcars. 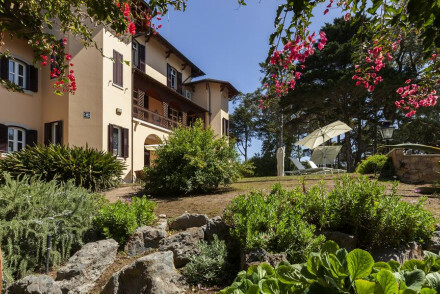 A lovely hillside B&B in Sintra, with great views of both the hills and castle from the pretty garden and terrace. Inside, elegant rooms have high ceilings and elaborate cornicing, while impeccable bedrooms feature fine hardwood furniture and quality linens. A real gem, and great value too! An majestic hotel in Sintra. Its room are decorative and ornate, in particular the beds, which are beautifully adorned with elegant headboards and eiderdowns. Perfect for a romantic break to explore the rich history and culture of Sintra. A charming Portuguese destination. Country Escape - An elegant retreat set in stunning countryside, with charming grounds, old world decor and fine dining. Great walks - There are beautiful walking trails in the surrounding Parque Natural de Sintra-Cascais. Sights nearby - Sintra National Palace, Moors Castle and Pena National Palace are all within a mile. Local markets - Explore the charming markets of Sintra, and pick up some local products. A beautiful Five Star mansion in the countryside. Opulent creamy bedrooms, suites and family rooms. Stunning gardens, two pools, barbecues, tennis courts, and an excellent restaurant. A great choice for a family holiday or romantic break. Sights nearby - Quinta da Regaleira, National Palace, Moorish Castle, Pena Palace and Monserrate Palace. Superbly situated on the border between a national park and the city, Sintra Marmoris Palace is an elegant 19th-century manor house. Offering a range of spacious rooms and suites with some more opulent and traditional than others. Wander around the lush garden and enjoy the fabulous views. A supreme hotel with championship golf courses, a state of the art spa, world class restaurants, and gorgeous grounds. Huge contemporary chic rooms and suites with balconies, all the mod cons, and stunning views towards the mountains. Luxurious, family friendly, apt for sports enthusiasts. Golf - The resort has its own 18 hole golf course. Active Holiday - Two world class championship golf courses. Foodies - Five innovative restaurants. Spa breaks - State of the art spa.